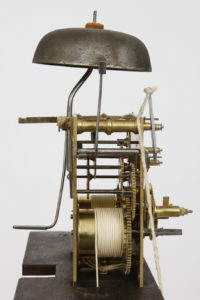 JOHN FESSLER Fredericktown Maryland (1760-1820) CHERRY TALL-CASE CLOCK, brass eight-day movement with identifiable “lantern pinions,” The works strike on a cast iron bell on the hour. 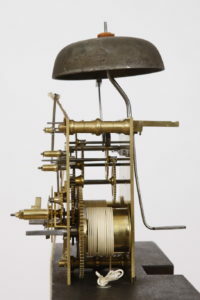 The clock movement has an original “pull on demand” strike repeat mechanism. 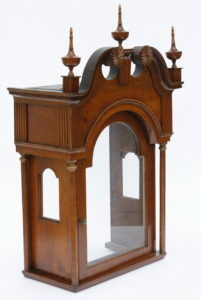 The bold broken arch bonnet terminating in carved rosettes, centering turned finial above fluted drop, sides with Greek key fretwork molding, applied fluted molding to corners, all above an arched glazed door flanked by turned columns, matching columns to back corners, with applied diamond-form fretwork molding above the rectangular case. 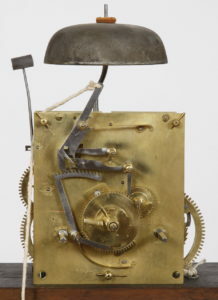 The shaped waist door with brass pull and lock escutcheons, flanked by fluted quarter-columns. 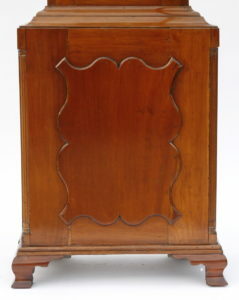 The base with shaped panel panel flanked by fluted quarter-columns, all on applied ogee bracket feet. 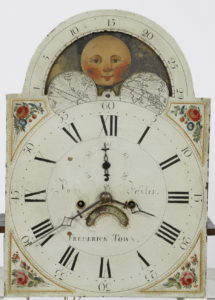 Untouched original signed painted iron dial with Roman numerals, seconds dial, moon dial, arched opening revealing calendar dial, spandrels having floral spray decoration within gilt-painted borders, signed “John Fessler” flanking the hands, and “FREDERICK TOWN” below calendar dial opening. 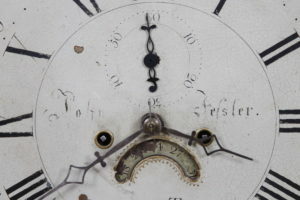 Original pendulum, weights, and period key. Long leaf Yellow pine secondary wood. Old refinished surface with desirable warm patina. 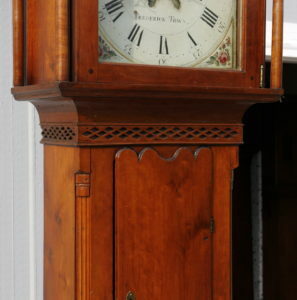 Dimensions: 110 3/4″ HOA, 22″ W, 12″ D. This clock descended in the “Sample” family of Maryland and later North Carolina. 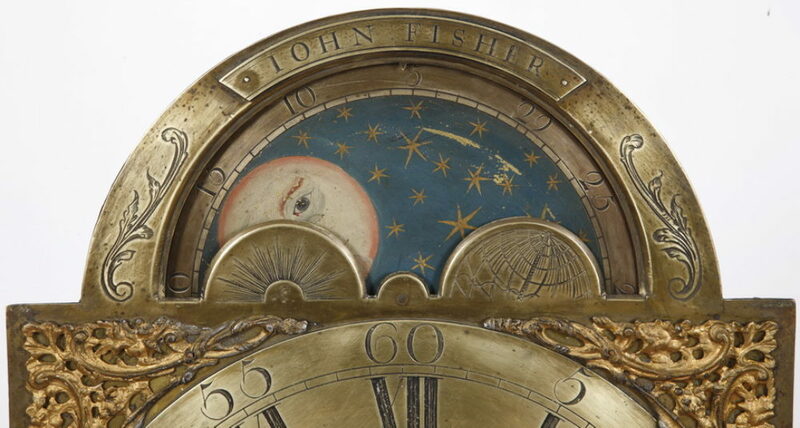 Family Provenance will be supplied with the clock.